Your favorite online retailer now sells the JNIOR! Go to Amazon to pick one up! You can get all of our models as well as a kit that includes the power supply. Would you trust your controller directly connected to the Internet? Disable all accounts except the administrator ‘jnior’ account. Changed the ‘jnior’ account password. There has been enough malicious activity attempting to login into the Telnet port that we have an application processing the access/log failed login reports and mapping the host locations. Try http://honeypot.integpg.com or https://honeypot.integpg.com if you prefer a secure connection. Note that this unit is running the current Release Candidate for JANOS v1.6.2 as we have continued to enhance the unit’s ability to withstand life on the open network. Do you have a need to control DMX-based lighting devices? You can do that now with the Model 410 and an adapter. This paper tells you what you need to do. If you want to try it, we can help you here. Meanwhile we are developing the 412DMX which will include a built-in DMX512 isolated interface. You may not know that we are creating a JNIOR Model 412 that supports the DMX512 protocol for lighting control. Basically a DMX Output port replaces the AUX serial port that we find normally on the JNIOR. This will be dubbed the JNIOR 412DMX. An initial prototype was completed and tested. It is functional. 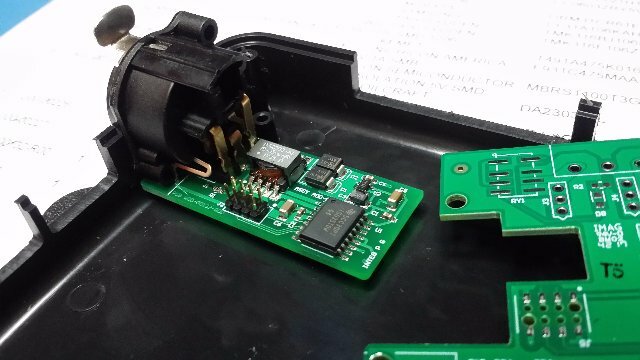 However, an issue in the mechanical mounting of the required 5-pin XLR connector necessitated a revision. By the slightest amount the connector interfered with the enclosure cover when mounted on the main PCB. 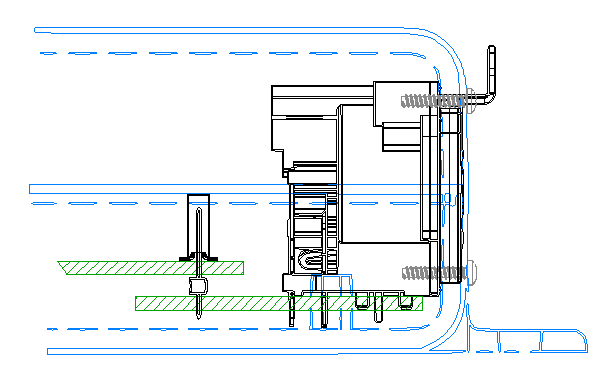 While some creative machining could accommodate the connector it is not the proper way to do it. 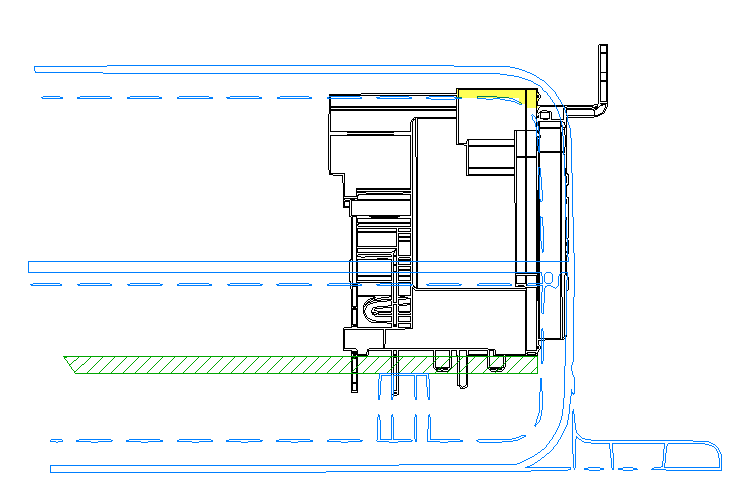 So the revision lowers the connector in an arrange as shown here. This should do just fine. We will see in a week or so. This also avoids an issue that Kevin pointed out where the release tab was sitting higher than the unit. It could easily be damaged or damage something else. Here we see that it will be safely below the top of the cover. In case you couldn’t picture the issue I show it here with the interference highlighted in yellow. You can also see how the release tab is inconveniently placed. The solution adds a little cost but is the proper implementation. 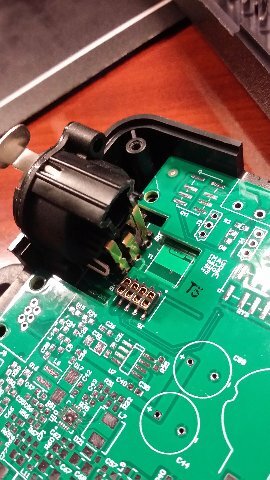 I’ve located the entire DMX512 ISOLATED circuit on that little piece of PCB so this could be used by other product models. The PCBs will be in this week and I’ll have to build a set. I milled one housing this morning and mounted the XLR connector to see how it likes its new home. 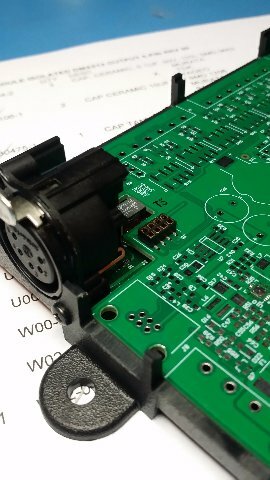 Now let’s hope that the PCB arrangement lines the connector up for this. Yeah so the R01 boards are in. The revision was needed to move that XLR connector down. 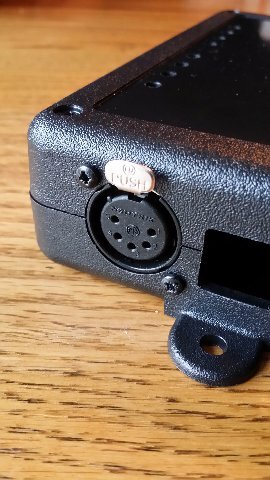 Perhaps you are mechanically inclined and can imagine what is involved in placing the DMX connector on the side of the enclosure. You need to reference the dimensions through the plastic housing and up through the PCB mounts and then onto the daughter board. So even though it can be done you are never 100% certain that you have it right until.. the hardware shows up. So there is joy! Time to celebrate with some whiskey, right? 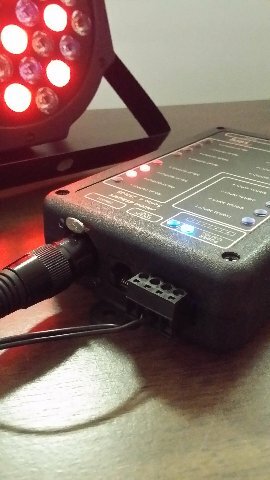 This is an ISOLATED DMX512 Output port. The isolation transformer is a tall component and that’s what that square recess is for. It will sit there. All of the RS-485 hardware and isolation is on that small PCB. The connector just carries Rx, Tx, Gnd, 3.3V and CHASIS connections. And that board will let me put these XLR connectors side-by-side for a product that has multiple outputs. Well I’ve populated the DMX module. Everything looks good except I need to used a slightly taller pin header. Not a problem. The 412DMX is ready to go. I just need to pull the package together for production. This prototype has 20 seconds of ride-thru power backup and 128MB of Flash storage. The 5-pin standard DMX XLR connector sits perfectly now in place of the usual AUX port. Did you know that I have been tweeting my progress with the 412DMX (hastag #412DMX) on Twitter? Follow us @integpg. I’ve been machining the first enclosure for this. There’s a video of some of it on YouTube.